Keller knows all about jaded, bitchy New Yorkers, of course. His first high-profile venture in Manhattan, a restaurant called Rakel, famously bombed in the early nineties. He fled to the Napa Valley and set up his kitchen in an old laundry building in the hamlet of Yountville, where he became, in due course, the most celebrated chef in all the land. The French Laundry is widely touted as the best restaurant in America, and Per Se seems to have been conceived, rather self-consciously, as its august big-city sibling. The rooms, which look out across the treetops of Central Park, feel grand but mildly antiseptic. The main dining room is colored, by the designer Adam Tihany, in muted tones of gray and brown, and decorated, at either end, with towering arrangements of foxtail lilies. The hyperattentive and hyperinformed wait staff are dressed in starchy dark suits and fat Armani ties, and as they troop silently to and fro in the ghostly evening light, the whole scene looks elegant but solemn and vaguely stagy, like a studious California version of what a first-class New York restaurant should be. There’s nothing stagy or solemn about the food, however, which is beautifully conceived, elegantly presented (on a new Thomas Keller line of dishes by Raynaud), and as varied as the colors of the rainbow. The menu, which changes daily, is a jumble of bite-size tastings, the most modest of which involves five courses ($125) including cheese and dessert. The standard chef’s tasting menu ($150) is nine courses, and one eventful evening, dining in the company of a well-connected media friend (without connections, the wait for a table at Per Se is two months), I got caught up in a seventeen-course meal. I never got out of Per Se in under four hours, but this five-hour extravaganza began with six varieties of vegetable soup (one for each person), reached a crescendo with a whole black sea bass stuffed with watercress (foraged by Rabbi Zvi), and concluded with a blizzard of high-concept desserts (thyme-infused ice cream, cucumber sorbet, a deliciously milky chocolate soufflé) that left our party feeling dazzled but a little overwhelmed, like a bunch of country bumpkins stuck at an elaborate but overly long magic show. Keller has reproduced many of his old tricks from the French Laundry (where he spends two weeks out of every month), but many of his dishes are new, too. Among the new items, one of my favorites was an inventive concoction called cappuccino of forest mushrooms, a dense, lightly creamy mushroom soup poured into a white cup, topped with a cloud of mushroom-infused foam, and served with mushroom-flavored biscotti. My friend the foie gras freak went quietly insane over a dish called chaud-froid (soft foie gras confit, apple purée, brioche croutons, and cipollini onions), which tasted both savory and faintly sweet, like a gourmet form of turkey stuffing. An old French Laundry favorite called bacon and eggs (bits of braised pig’s head, molded in a cake, with a poached quail egg wobbling on top) is bound to become a favorite here, too, as is a sinfully tasty dish called macaroni and cheese, composed of more butter-poached lobster, orzo folded with mascarpone and a creamy lobster broth, and a single, round Parmesan crisp. This kind of careful, painstaking cooking is designed to be consumed in a leisurely, Californian manner, but as an edgy New Yorker, I found myself rising from the table to visit the very high-tech bathrooms (the motion-sensing equipment takes some getting used to), or just to stretch my legs. Which is not to say that I didn’t enjoy my bowl of hand-rolled trilli (soft, chewy pasta, loaded with truffles), my mini-loin of rabbit, lovingly bound in apple-smoked bacon, or the perfectly cooked duck breast, decked with slices of sweet ruby plums and nuggets of foie gras. Keller has a special facility with snails (they’re as different from rubbery escargot as greasy French fries are from pomme soufflés), and if you see anything on the menu involving scallops (they’re as big as plums, and about as succulent), you should order it. Ditto the boeuf grillée, which is a cross between Kobe and Black Angus (meaning it has the texture of the latter with the rich taste of the former) and is served in bordelaise sauce with a little nickel of crisped bone marrow. Per Se has been open for seven weeks now (its original opening was postponed thanks to a well-publicized fire), and considering the rabid anticipation surrounding the restaurant and its grim, aggressively commercial location, the pace is quiet, even sedate. On the evenings I visited, the crowd was a motley collection of gawking magazine editors, blasé celebrities (a leathery-looking Nicolas Cage), and pious gourmands who dined in solitude then shuffled back to the kitchen to pay their respects. For dessert, they picked at artisanal cheeses (the best being ricotta tucked into round, barely poached ravioli), and creations like the house “creamsicle,” which consists of an eggshell of hot, melted chocolate poured over a scoop of orange-scented vanilla ice cream. There’s a fine rhubarb tart, too, and sugary little croutons of polenta, stacked like dice and served with pickled peaches and thyme-flavored peach sorbet. It all tasted quite impressive in the hushed restaurant gloom, although I couldn’t help wondering whether it would have tasted even better sitting a world away, in sunny Yountville, on a bright California afternoon. 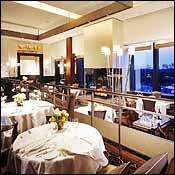 Per Se, 10 Columbus Circle (212-823-9335). Lunch, 11:30 a.m. to 1:30 p.m. Friday through Sunday. Dinner, 5:30 to 10 p.m. daily. Five-course tasting menu, $125; nine-course vegetable tasting menu, $135; nine-course chef’s tasting menu, $150. All major credit cards.